You want to make more money. Consider this. New clients frequently tell me that they want to make more money and get promoted. They say that more money is going to make them feel valued and appreciated and happier at work. Does this ring true for you or someone you know? Money is great. It gives you access and enables you to do things you care about like give it away, support important causes, buy food, and trade it for precious time. And, money is only one currency. Cultural messages teach you that money is the ONLY currency. Prevailing messages want you to believe that money (or title) is the measure of your self-worth as an employee and a human being. Please indulge me with a story. My family closed on a new house yesterday (Yikes!) which means we had to sell our house (double, triple Yikes!). We set our sale price and strategized with our realtor. We were walking out the back door to the airport for vacation as our first buyers were walking in the front. Our house sold in 2 days with 5 offers (whew and wow and head still spinning). When we returned after a week away, numerous friends said to us that we could have charged more for our house. In my vulnerable, post-vacation state, I started down the path of a freakout. Did we sell out? Could we have gotten more? Money, money, money! Then I was reminded (thank you Steve and our amazing realtor, Brad). We consciously chose currency other than money for the sale of our house. We wanted potential buyers to feel excited (they did). 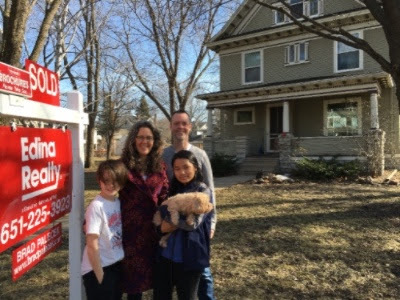 We wanted great new neighbors for our beloved neighbors (yes!). We wanted buyers who would love our house and care for the garden like we do (they will). We wanted the entire process to be easy with as little stress and disruption to our family as possible (we were literally taking offers in our flip-flops on the beach and never had to do the "clean and run" I have heard is so stressful - can't get easier than that). Our currency in this sale is great relationships, ease, little to no stress, and a great couple we are delighted to welcome home. For what amount of money would we trade all that? No amount. When you look around your work and life, what's the currency you use to measure your success and value? (Here are some hints to work with: love, creativity, relationships, contribution, work/life balance, feeling deeply fulfilled, joy, ease). Let's work together to change the measuring stick. As MasterCard used to say, your ease, joy, and happiness are priceless! The dog-eared copy of the designed alliance process. It's so central to my relationships that I carry it in my purse. My husband and I were staring down a few intense months of traveling and kid hand-offs like ships passing in the night with little time to connect or talk. We feared we’d be snippy with each other from the stress and were not looking forward to spending months doing THAT. Instead of leaving those months to chance, hoping for the best, and gritting our teeth and powering through it (which we've all done many, many times), we decided to design our alliance. A designed alliance is my #1 favorite relationship tool because it’s simple and effective and contributes to the Principle of Escalating Positivity. A designed alliance enables you to be conscious about your relationships and clear about what you need and want in a given situation. Always. (Just kidding. And not really). Your in-laws come to visit. You are starting a new project team at work. You are hosting a party. You are going on vacation. With your boss, your direct reports and your colleagues. Chores, roles, and responsibilities at work and at home. Create a designed alliance any time you want to bring consciousness, creativity, and connection to an event or experience. 1. Set a time to design your alliance. 2. Name the topic, event or experience. Your best hope for the event. Your worst fear for the event. How do you want it to feel between you during the alliance? How do you want to be with each other when one of you forgets or messes up or things go wrong? What requests do you have of each other? What agreements need to be made? What can the other person count on from you? 4. Appreciate the other person (for their creativity, clarity, willingness, honesty). Example: A friend calls on the phone and you have 2 minutes to talk. Instead of rushing, making yourself late, and feeling bad that you couldn’t give your friend enough time, say “I have 2 minutes to talk, what do you need right now” or “How can I best help you?” You’ve just designed an alliance and brought clarity to your relationship for those 2 minutes. Example: Some designed alliances are more involved. My husband and I talked for an hour and went through each step of the process consciously. We designed that we wanted things to feel easy and flowing during those intense months. We would use texting as a way to connect when we were apart, and we’d be honest if we were starting to feel disconnected or frustrated. Those few months went by beautifully and easily. So, this holiday season as things ramp up at work and at home, take some time to design alliances to bring clarity and intention to your relationships. You'll be contributing to the Principle of Escalating Positivity! And it will make everything so much easier for you! At the holidays your children are home for two solid weeks (and if you don’t have children, your friends with kids need you more than ever), you’re planning (or avoiding) time with your family, and you’re cherishing (or not) those who are closest to you. At work, performance reviews may be coming in January which makes everyone feel warm and fuzzy with anticipation. As a special treat for you, the December theme at Boyd-Smith Coaching is the Principle of Escalating Positivity. Each week, I’ll share tips and strategies for not only surviving the holidays (including your relationships) but actually thriving and maybe even enjoying yourself and your people! Even our happiest, best relationships can slip into negative patterns or moments when a shot of positivity would have gone down better than what we actually said (I don’t know anything about that. I just read about it). It’s so simple. So obvious. And yet we don’t do it enough. 1. Choose one of your close relationships. 3. Actually appreciate them (out loud) 3 times a day. 4. Up the ante on yourself by adding more people to the list of appreciation recipients. Try your boss, your annoying sister, the driver who just cut you off, or the cashier who is taking forever to ring up your groceries. You will be amazed at the results. Really and truly. Hit reply to this email and let me know what happens! Without an ending, stuff you don't want will stick and come with you on your journey like an unwelcome parasite. One of my clients called for her session in tears last week. She had wanted to change jobs for two years and finally accepted a new position. She gave her notice with joy. Then she entered a period where she felt nothing. Until, one day, big emotions started pouring out. She was baffled and relieved to be experiencing sadness. As she talked about the company she was leaving, her deep relationships and the many important experiences she had there became clear. She had grown up as a person and as a professional at this company. Leaving represented saying good-bye to the person she had been and entering her new job further evolved. Before she could move forward, she needed to end well, to close the experience of this job cleanly. Say good-bye to things that need to be left behind. You can say a quiet good-bye to yourself or have conversations or create rituals that enable you to let go. I once burned a stack of letters from an old boyfriend as a ritual to ensure that he left for good. Honor important relationships. When you leave a job or an event, tell people what they meant to you and what you learned from them. Do it even if you cry. Do it even if the relationship was hard. Choose the insights you want to take with you. You get to decide what to take to your next opportunity or relationship. Be conscious of how you’ve evolved, claim those things, and add them to your life toolbox. Whenever you leave, consider how to give the experience an end. Whether it’s a quick hug at the end of a dinner party, a tearful conversation, or a ritual burning of letters, a good ending leaves you free to begin the next step of your journey from a fresh, clean place.